WASHINGTON, D.C. -- While the majority of Americans (55%) think that drinking in moderation makes no difference to their health, the percentage who say it is bad for one's health outweighs those who say it is good, 28% to 16%. 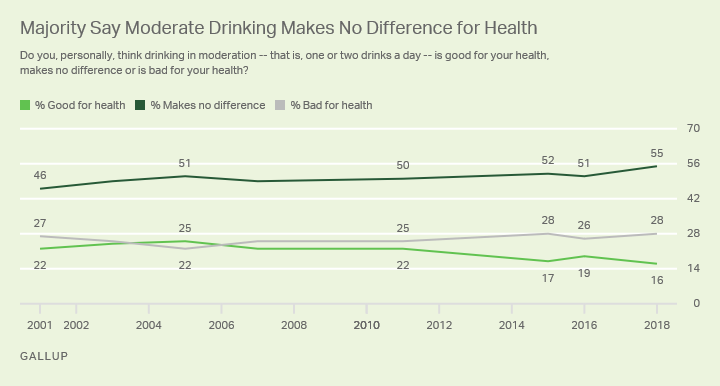 Over time, Americans have become slightly less likely to say moderate drinking is healthy. "When you hold all [background] factors constant, what we and many, many others have found is that drinking in moderation … is beneficial, and people who drink in moderation live longer." That was the conclusion of Dr. Eric Rimm of Harvard Medical School and the Harvard School of Public Health -- and a noted authority on the health consequences of lifestyle choices -- on a recent Gallup podcast. Adopting a more negative tone than other authorities, the government's Centers for Disease Control and Prevention says: "Although past studies have indicated that moderate alcohol consumption has protective health benefits (e.g., reducing risk of heart disease), recent studies show this may not be true. While some studies have found improved health outcomes among moderate drinkers, it's impossible to conclude whether these improved outcomes are due to moderate alcohol consumption or other differences in behaviors or genetics between people who drink moderately and people who don't."